So, I’ve been on a bit of an ancient medicine binge lately. Most recently, my body has begun to harness the greatness that is apple cider vinegar (ACV). Before I started with Natural Solutions, I had never really considered drinking vinegar for health reasons, but after listening to testimonials and doing my research, I decided, what the heck? I’ll give it a try. At the end of this week, I’ll have been drinking about two to three tablespoons of ACV mixed with eight ounces of water every day for the past four weeks. Since then, I’ve noticed changes in my energy levels, the way my skin looks and feels, digestion, and even changes in my weight. I highly recommend that anyone looking for a health boost considers taking a few shots of ACV a day. 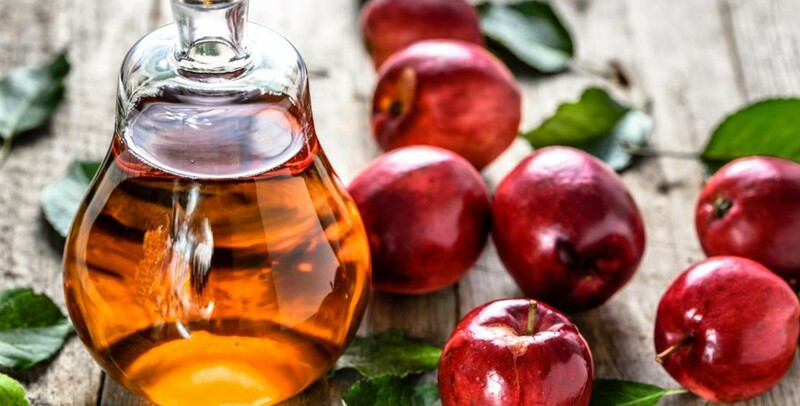 If you do decide to try ACV, make sure you’re buying pure, organic, and unpasteurized, which contains the “mother of vinegar”—the live probiotic-filled portion of the vinegar that holds its healing properties. My favorite ACV is made by Bragg’s; you can find it at most grocery or health food stores. ACV contains more than 90 different nutrients such as potassium, calcium, magnesium, chlorine, copper, iron, fluorine, acetic acid, and sodium. Also, you’ll find various trace minerals, amino acids, and fiber from apple pectin; as well as an abundance of vitamin C, and smaller amounts of vitamins A, B1, B2, B6, and E.
ACV helps digestion the minute it hits your tongue. Acid receptors start to stimulate the production of saliva, beginning the breakdown of carbohydrates. The vinegar then enhances the action of hydrochloric acid and digestive enzymes in the stomach, breaking down foods that might otherwise linger for several hours in the digestive tract. Our skin is directly affected by the health of the gut, so if digestion is improved, your skin will benefit. ACV is also known to improve liver, kidney, and bladder function, which helps keep the body detoxified. Acne is often caused by toxins clogging the pores, so using ACV will help release those toxins and keep skin clear. Other skin ailments ACV will help relieve include eczema, psoriasis, and rosacea. By applying ACV directly to the scalp, you will destroy bacteria/fungus that causes dandruff. Apply to the scalp, rub in, and leave for 30 minutes before washing your hair normally. To eliminate buildup from hair products, and to get a softer, shinier mane, mix together one part water and one part ACV and pour onto hair after shampooing. Let the vinegar sit for two to five minutes and rinse with water. No need for conditioner. ACV’s amino acids neutralize the build-up of lactic acid in the bloodstream that occurs after stress and exercise. Researchers believe that regular use of ACV can help combat fatigue and give you an energy boost without the use of caffeine. There is no concrete scientific evidence that proves ACV helps you lose weight. However, researchers believe that the pectin in the vinegar suppresses your appetite, and its acetic acid increases your metabolism and reduces water retention. Scientists also believe that ACV interferes with the body’s digestion of starch, meaning fewer calories are able to enter the bloodstream. When using ACV with a plant-based diet, the vinegar can help reduce the body’s acidity and increase alkalinity. By creating a more alkalized environment in the body, there is more oxygen, thereby hindering the growth of pathogens and free radicals. An alkaline pH reduces overall inflammation, improves bone health, and can rid the body of toxins. Samantha Fischer is an editor for Natural Solutions and Alternative Medicine Magazines. Follow the publications on Twitter @naturalsolution and @altmedmag, or follow Sam @samanfisch.